While working on "the return of the blue baron" we started writing a bit of the back story. The original was never actually set anywhere. When Jeff ran it he placed the Baron's castle in the city of Blueholme. In reality these adventures can be popped into whatever world you have created for yourself. As it stands right now we have basically finished writing and are now on to what I like to call "Edit City", afterwards it's layout city. I think I will make this adventure 8x11 for the sake that most people will print it if they run it. I am also going to start gathering together some nice clip art and images from various sources. I like to have a pool of graphics to pick from one I start working. Anyways, yesterday while recording some vocals with a nice Russian lady, I doodled this map and then did some editing on it at lunch. All of the towns are in German, I used google translate with some basic names. The barony is part of a large kingdom ruled by a Queen, in my mind the Blue Baron's territory is sort of Germanic/Bavarian (hence the silly translating). 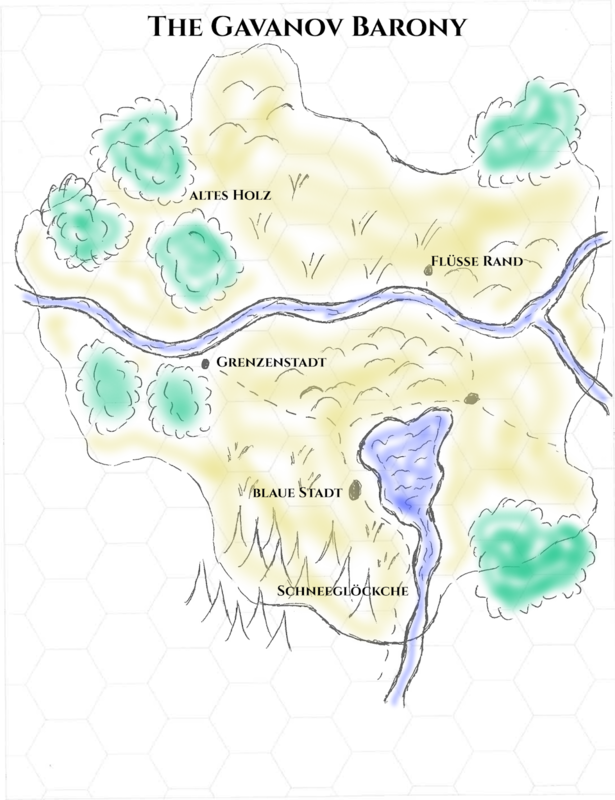 There isn't really an intention to have this within the module, as I say I just did a little map doodle for fun.